Built 1694 by Giovanni Pietro Tencala as a city palace for Philipp Sigmund Graf von Dietrichstein. Ca. 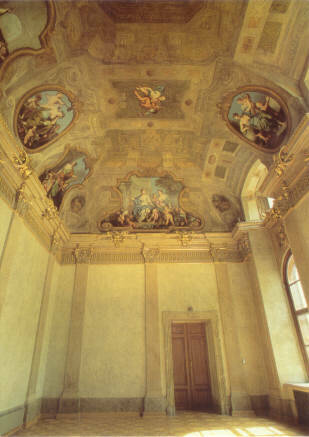 1730 decoration of the "Festsaal" (also known as "Eroica-Saal" after Beethoven's Symphony No. 3 that was first performed there). 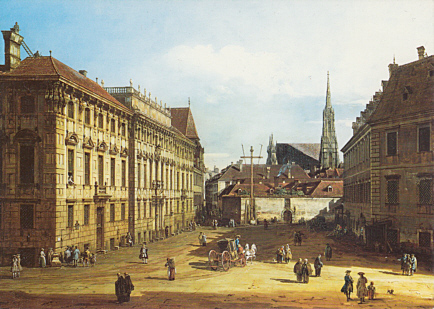 From 1745, used as city palace by the Lobkowitz family. From the late 19th century, used by embassies and cultural institutes. 1979-1991 major renovation. 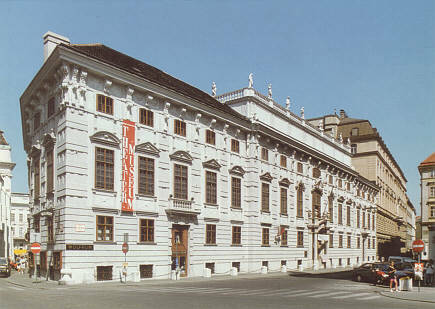 Re-opened 26 Oct 1991 as a theatre museum, including the puppet theatre "Richard Teschners Figurenspiegel". Reverse Text: "Bernardo Bellotto, gen. Canaletto 1721-1780. Lobkowitzplatz 1758/61"
Reverse Text: "Österreichisches Theatermuseum im Palais Lobkowitz, Wien - Austrian Theatre Museum in Lobkowitz Palace, Vienna"
Reverse Text: "Österreichisches Theatermuseum im Palais Lobkowitz, Wien; Eroica-Saal, Uraufführungsort der 3. und 4. Symphonie Ludwig van Beethovens - Austrian Theatre Museum in Lobkowitz Palace, Vienna; Eroica Hall where Ludwig van Beethovens 3rd and 4th symphony were first produced"